Body Transformation: Ashley Ackett Cut College Calories! Ashley rose above college social pressure and found a healthy life that delivered true happiness. 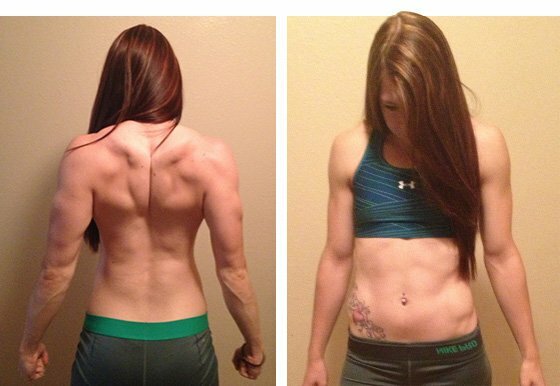 See how dedication and hard work helped her lose 14 percent body fat! At age 12, I weighed more than 160 pounds and was a champion couch potato. As I got older, I lost weight when I played high school sports and danced competitively. I saw my brother as a role model and wanted to be a star athlete like him, so I started lifting at age 15. I saw a photo of Ava Cowan when I was 16 years old and wanted to look like her. I loved lifting and was very strong, but I wasn&apos;t fit because I didn&apos;t know how to make healthy nutrition part of my daily lifestyle. That caused constant disappointment with my overall physique. Every pair of shorts and pants got tighter and my clothing size kept increasing. I reached my heaviest weight as a college freshman. It was easy to grab a pint of ice cream or a greasy burger, study for tests and exams, and call it an evening. I decided to ask my brother for help and he directed me toward healthier eating habits, which helped me lose a few pounds by December 2012. I went home to my family, who lived in Italy at the time because of my dad&apos;s previous military service, and gained the weight back from holiday goodies. When I returned to college, I was unhappy with myself again. My boyfriend, a powerlifter and huge fan of bodybuilding, decided to show me some useful tips on Bodybuilding.com. He helped me understand macronutrients and how to use them to meet my goals. I became totally obsessed with nutrition and constantly researched articles. As time went on, I went from cheat meal weekends, to cheat days, to weekly cheat meals, to no cheat meals. I understood what it meant to eat clean and how to make fitness a lifestyle. I realized how much I loved eating healthy and clean because of how I looked and felt. My boyfriend and I have a goal to lead a fit and successful lifestyle to inspire others. record for combined total weight! I did lots of research about nutrition. In the beginning, I documented every item of food in a workout journal I received as a free gift in a Bodybuilding.com order. I wrote down every meal, supplement, and workout, which helped me stay accountable when no one was there to motivate me. Eating clean in college dorms isn&apos;t easy, but I made it work. I cooked almost everything in a tiny microwave including oatmeal, sweet potatoes, meats, egg whites, and veggies. My boyfriend and I made lots of sacrifices to be fit. We spent the little money we had on healthy food and supplements. When we had extra, we invested in kitchenware that made the process easier. We gave up partying, drinking, and most social activities to keep up with school and fitness. Some might think it sounds extensive but we are passionate about the lifestyle and don&apos;t regret it at all. I made time for the gym and prioritized. My transformation isn&apos;t over. I will get leaner to better my physique. I have aspirations to get on a figure or physique stage and eventually earn a pro card. I hope to be a big name in the fitness industry and use it to help others with their goals and dreams. I will continue to push forward until my dreams are reality. I love to lift heavy weight. I get lots of motivation from IFBB physique pro Dana Linn Bailey. My training philosophy is to train until I&apos;m exhausted. I grow the most with this method. I include HIIT cardio training 2-3 days per week, which is often track sprints. Living in a college dorm with limited funds while trying to eat clean was difficult, but I saw no room for excuses. Clean eating was a challenge in the beginning because I viewed it as a diet and couldn&apos;t wait for my next cheat meal. Now I have treats, not cheat meals. I still get strange looks when I pull out my healthy food in public. It can be challenging when friends and family question my lifestyle. I will step on stage as a figure or physique competitor and eventually earn my pro card when I can make the time and money commitment. I want to become a sponsored athlete for a supplement company and use my success to inspire others. I love bringing people into this lifestyle and want to be a role model for women, especially college women. I want to prove that this life is possible if you&apos;re willing to work hard. "Don&apos;t be afraid to fail; it&apos;s a stepping stone to success." Don&apos;t wait to chase your dreams. Now is the perfect time to start. Don&apos;t be afraid to fail; it&apos;s a stepping stone to success. Transform for your own good and stay accountable. When you want to give up, remember why you started the journey and find inspiration to keep moving forward. Motivation can come from those around you, so build a supportive network of people you look up to. I&apos;ve always ordered products from Bodybuilding.com, especially when I lived in Europe because of my Dad&apos;s military orders. Bodybuilding.com always delivers the best products in short time. The site provided me with a huge array of articles about training, nutrition, and supplementation. The articles make fitness easy to understand so I can achieve my goals quicker. Thank you, Bodybuilding.com! To God for giving me the ability to work hard and be healthy. To my brother Nick who introduced me to the fit lifestyle and pushes me to this day. To my parents Nina and Harold who supported and encouraged my dreams. To my boyfriend Luis who holds me accountable when I&apos;m at my lowest points.